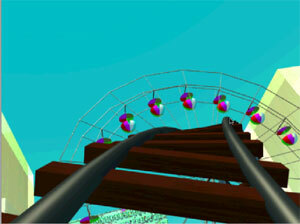 VRML Park is an amusement park, in which you can click any of the rides and thus mount them. It was my first major interactive multimedia project, developed in 3D Studio Max and VRML. Got it all? Now, enter VRML Park. No VRML? Click on the image on the right to view an animated movie. Click on the image to launch a non-interactive animation of the park.